Being a huge fan of "Monkey", I was elated to discover that the premise of "Monkey Magic" was still going strong in the world of international films with "Monkey Journey to the West" finally being released on DVD that follows the popular Chinese mythos. 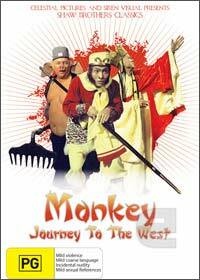 Brought to us by the Shaw Brothers Studios, Monkey Journey to the West follows the exploits of Monkey (anger), Pig (lust) and their keeper, monk Guan Ying as they travel the world in search of enlightenment. This current edition contains four films that include Monkey Goes West, Princess Iron Fan, The Cave of Silken Web and The Land of Many Perfumes as the viewer is taken on a wondrous journey of demons, men and religion that is often light hearted and contains a healthy dose of action and adventure. The video quality is rather impressive, considering the age of the title with sharp colours that is matched with decent sound quality. Filmed in a variety of authentic and studio locations, the creators have truly recreated an inspirational Chinese fairytale that have an almost surreal atmosphere and story to them. Definitely one for those looking for something a little different.